24.01.2014. On January 17-19 Copenhagen hosted the Ferie and Fritid travel fair, at which, alongside other holiday and leisure industry representatives from around the world, the Georgian tourism company Discover Georgia was represented. The Georgian company presented to the fair visitors with all kinds of tours throughout Georgia including sea, mountain, wine, and biking tours. The fair was attended by the Georgian Ambassador in Denmark Nikoloz Rtveliashvili. According to him, the number of visitors from Denmark to Georgia is increasing year to year. According to the official data in 2011, 1,500 tourists visited Georgia, in 2012 – 2,200 tourists. The ambassador says that there is no official information for 2013 regarding the number of tourists, although he is sure that their number is even more than in 2012. Director of Discover Georgia Nino Kekelidze believes that this fair will bring success to her company and attract more tourists from Denmark and its neighboring countries to Georgia. “Guests are mainly interested in mountain tours in Georgia, especially biking tours. Also, there is great interest in architectural and ancient sightseeing. Their main points of interest are Svaneti, Tusheti, Kazbegi and other mountainous region in Georgia. We also offer them wine tours in Kakheti,” Kekelidze told The Messenger. Marketing Coordinator of the National Tourism Administration of Georgia Tamar Kakhidze also attended the Copenhagen travel fair. 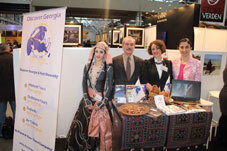 “Such exhibitions provide us a great opportunity to introduce Georgian tourism potential abroad. Hundreds of people visited out stand during the fair and they showed great interest in our country. This gives us hope that more people will be visiting Georgia this year,” Kakhidze told the paper. The three-day fair was held at the Bella Center Exhibition Hall and according to official information, 42,072 people who wanted to update their knowledge about the vacation and recreation industry, stopped by center and got acquainted with numerous countries’ tourism potential.